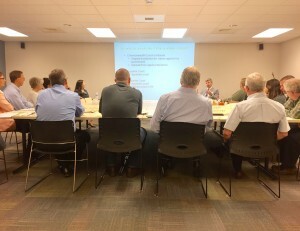 Attorneys Lindsay O’Neil and Jason Asbell presented “Basics of Litigation” to GKH clients and friends on May 18 at the main office in Lancaster. The presentation was part of the firm’s complimentary seminar series, which regularly offers basic legal information to the public at no cost. Attorneys O’Neil and Asbell, members of the firm’s litigation practice area, shared information and insights gained from their experience with all aspects of the litigation process. From the filing of the initial complaint through the trial and possible appeal, the presentation explained the basics of pursuing justice through the civil court system. Alternatives to litigation, including settlement, mediation and arbitration were also discussed. Click here to view the seminar PowerPoint presentation. The GKH seminar series resumes on August 22 with “Legal Issues at Public Schools.” For the complete 2017 seminar schedule, click here.